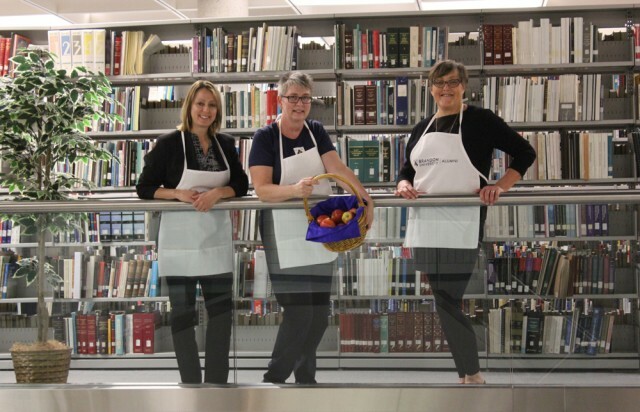 From left: Carla Eisler, Brandon University Alumni Officer; Deb Carnegie, president of the Brandon University Alumni Association; and Caroline Mullins, a Brandon University nutrition instructor, handed out apples as a healthy study snack to students around the BU campus on Wednesday evening, Dec. 9, 2015. 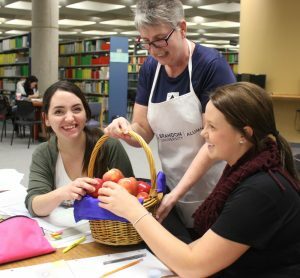 An apple a day is good for a lot of things, and for Brandon University students who are cramming for exams this week, it’s a nice boost of fresh nutrition while they hit the books. Putting a fresh spin on the old apple-for-teacher idea, one BU instructor has partnered with the Alumni Association to deliver fresh fruit throughout the university’s study areas during evenings all this week. Mullins, a nutrition instructor in Health Studies, partners with the Alumni Association to deliver fresh fruit to weary students who may be more used to salt- or sugar-heavy snacks, washed down with a heavy dose of caffeine. Deb Carnegie, president of the Brandon University Alumni Association, hands out apples as a healthy study snack to second-year nursing students Alex Dubnick (left) and Kiara Hildebrand, on Wednesday evening, Dec. 9, 2015. “Oh, these are so cold and good,” said second-year nursing student Erin Wedgewood, who crunched into an apple Wednesday evening while studying with a few fellow students. Alumni Association President Deb Carnegie and Alumni Relations Officer Carla Eisler also donned aprons to hand out fruit. Apples and oranges are the most popular, Mullins said. They’re tasty, nutritious and last a long time. Bananas, for example, she said ripen too quickly. Fruit deliveries happen every evening for about a week, twice a year in the study-heavy time around exams, and other BU faculty and staff are welcome to join in, she said. This is the third year for fruit delivery at BU. Mullins says she was inspired to start it after her own children texted her asking for something to eat, and when she arrived, there were empty pizza boxes everywhere. Any donations received on or before Dec. 31 are eligible for a 2015 tax receipt. Online donors please write “healthy fruit drive” for the gift designation to ensure the money goes to the correct account. In the spring, the Alumni Association also provides ice cream cones as “exam relief” and also partners with BUSU to provide free nachos during their January trivia night. Exams at Brandon University start on Saturday, Dec. 12 and most wrap up by Saturday Dec. 19. Full timetable.